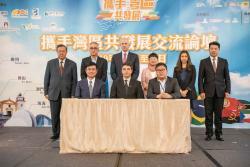 MGM signed a letter of intent today with representatives of both Ceará Industrial Centre of Brazil and Vang Kei Hong Trading Co., Ltd. on the purchasing of certified food and agricultural products, in the business matching session of the “Work Hand-in-hand to Explore Greater Bay Area Opportunities 2019” event organized by the Industry and Commerce Association of Macau. The agreement aims to facilitate the access of Macau and the Greater Bay Area market for Brazilian SMEs, leveraging the city’s unique positioning as a service platform for trade cooperation between China and Portuguese-speaking countries. MGM always hopes to establish cooperation with Portuguese-speaking countries. In addition to MGM’s purchasing department, MGM SME vendors and members of Macao Young Entrepreneur Incubation Centre, representatives from the Brazilian Service of Support for Micro and Small Enterprises (SEBRAE) and Ceará Industrial Centre travelled all the way from Brazil to participate in today’s business matching session to promote Brazilian products and to initiate cooperation talks with enterprises from Macau and the Greater Bay Area (GBA). As a result, Mr. Hubert Wang, Senior Vice President of Finance & Chief Financial Officer of MGM; Mr. André de Freitas Siqueira, President of Ceará Industrial Centre; and Mr. Vincent Ip, Marketing Director of Vang Kei Hong Trading Co., Ltd., signed the letter of intent under the witness of Ms. Irene Lau, Acting President of Macao Trade and Investment Promotion Institute; Dr. Shuen Ka Hung, Director-General of Macau Productivity and Technology Transfer Center; Ms. Chan Hoi Si, Business and Commerce Support Division Head of Macao Economic Bureau; Mr. Yu Kin Chor, Vice Chairman of Macau Chamber of Commerce; Mr. Kevin Ho, President of The Industry and Commerce Association of Macau; and Mr. Grant Bowie, Chief Executive Officer and Executive Director of MGM China Holdings Ltd.
Mr. Vincent Ip, Marketing Director of Vang Kei Hong Trading Co., Ltd., expressed his sincere gratitude to MGM for providing such a precious opportunity to expand cooperation with Portuguese-speaking countries. He said that SMEs and young entrepreneurs would benefit greatly from today’s business matching session. Mr. André de Freitas Siqueira, President of Ceará Industrial Centre, said that MGM provided a great opportunity for Brazil to tap into the markets of Macau and the Greater Bay Area.